To con­tin­ue the line of thought from my last entry, anoth­er type of com­po­si­tion that I find can work on grey, over­cast win­ter days when the light is per­fect­ly flat and even is a “high-key” image like this one. 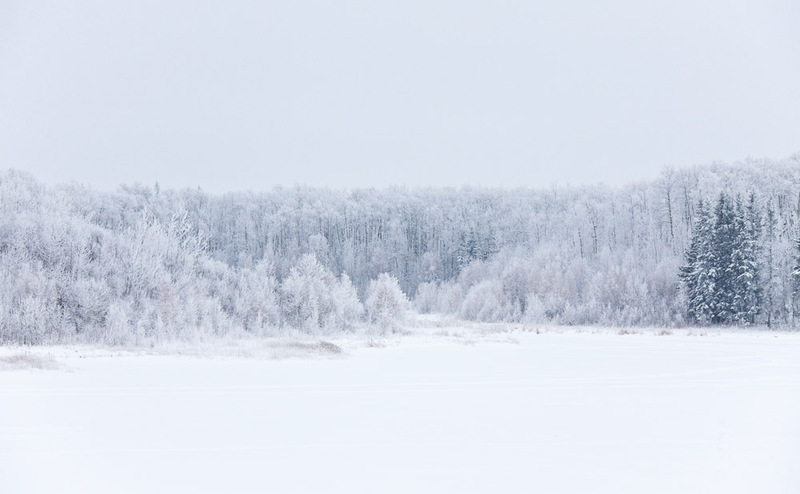 If there’s fresh snow, the whole land­scape can turn the same colour – light grey. I find the trick is to ensure that my expo­sure is bumped up a lit­tle bit to turn the greys to white, and to find a lit­tle bit of con­trast (spruce are great for this) for visu­al inter­est. These very sub­tle, almost monot­o­ne, images real­ly cap­ture the feel­ing of these most-sub­tle of win­ter days.